The operation of a lean, supply-safe network is becoming increasingly important for grid operators. The importance of quantitative assessment of supply security is increasing. 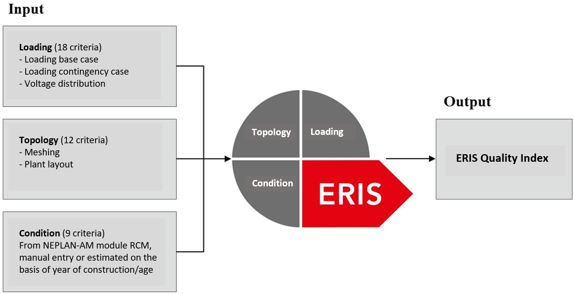 With ERIS (Evaluation of Reliability Index for Electric Systems), you receive an ideal tool for network planning and development as well as for the systematic determination and measurement of supply security during operation. ERIS helps to quantify the security of supply. ERIS can also be used to measure the impact of expansion and renewal investments. ERIS gives security of supply a value that can be used for the targeted network and the renewal planning. ERIS is a non-uniform number between 0 and 120, whereby 120 corresponds to an ideal network. If a network variant has a value greater than 100, the security of supply is above average (overcrowded). Conversely, ERIS values below 80 require action. A value less than 60 is not permitted. The ranges result from the set planning principles. This allows you to define your specific supply security requirements. Adjustable planning principles include, among other things, the maximum permissible line load or the targeted proportion of the switchgear systems that are better than (n-1) connected. The assessment is based on the three main categories of loading, topology and condition. This means that all network-relevant criteria for the evaluation of a network or subnetwork are taken into account.